December 2014…Phillip and I pack up our Wallingford apartment and bid Washington goodbye, heading south to the San Francisco Bay Area. A homecoming six years in the making, I now find myself a born-again Californian, re-learning my way around town and pining for the Pacific Northwest (pun intended). But before the ravages of time lead me to completely forsake the Evergreen state for the Golden one, I want to make a record of some of my favorite places in the Puget Sound as they were when I knew them best. There’s no more logical place to start this series than with the thing that I think about immediately upon waking up each morning. For the gallons of coffee Seattleites are reputed to chug morning, noon, and night, it is no surprise that there is a lively tradition of baked goods to accompany it. In fact, this culture has bred a number of rivalries, some of which are pretty fierce (in a PNW passive-aggressive sort of way) – just ask a local if they prefer Trophy Cupcakes or Cupcake Royale, Top Pot or Mighty-O Donuts. Pride aside, I think everyone can agree that there’s no finer accompaniment to a shot of dark, strong espresso than a flaky, powdery sweet treat. And since I’ve repeatedly tried my hand at baking to varying degrees of success, I must give respect where respect is due – these are some great bakeries and you’d do right by your stomach to give them a try. It took me ages to make my first visit to Honoré, as getting there demanded a two-transfer bus pilgrimage from my old apartment in the Ravenna neighborhood. Even in Wallingford, where I lived most recently, Phillip and I would routinely pedal four miles uphill, usually in a nice Seattle drizzle for a snack – some places are just worth the extra effort. But on a sunny day, the trip is especially rewarding as there’s a lovely patio in the back, though the stuff of note is sitting behind the glass up front, and proofing on racks in the kitchen. Pastries, French ones, united in butter, and spanning the whole of the Héxagone. You’ll find canelés from Bordeaux, kouign-amann from Brittany, quiche lorraine from, well, Lorraine, and danishes, from the…Danish part of France. They’re all delightful, but I tend to stick with a croissant and a coffee (beans from Lighthouse!) and slip my way into a seat at the window. 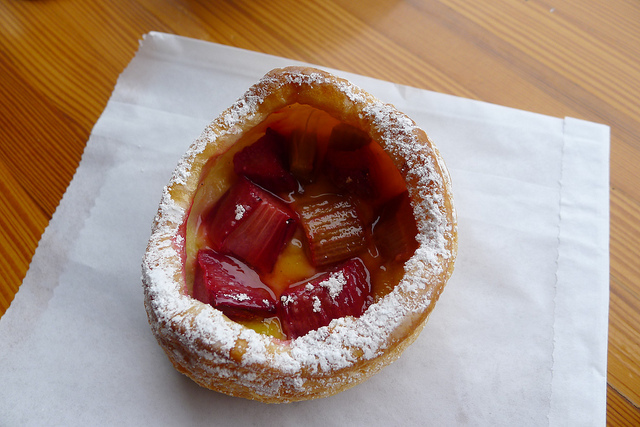 There are several Essential Baking locations in Seattle, but the Wallingford café is a gradual roll down the street from our old house, perfect for a weekend morning roll out of bed. They’re got hearty breakfasts and giant kale salads, but Phil and I always come for the toast, and not the six-dollar artisanal slice that’s served in San Francisco. For just under three bucks, which sounds so cheap in comparison, you can get three thick slices of any of Essential’s breads (we’d both recommend the mille gran) and an unlimited amount of raspberry freezer jam*. Grab a bottomless cup of Victrola coffee and an issue of the Stranger, too! We don’t make much a fuss over their pastries, but their bread – always and forever! *How did I go twenty years not knowing about freezer jam? Is it just a Washington thing? 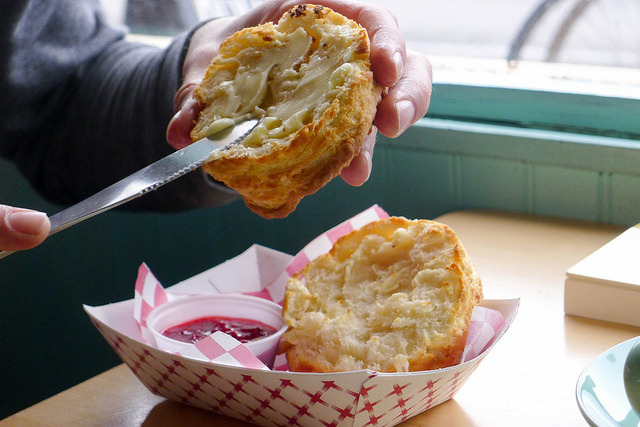 Biscuits seem to be few and far between in Seattle, so it was good luck that Morsel was a jog up the Ave, not far from where I worked. They can do up your biscuit any way you’d like, and while Phil and I keep our selection pretty simple, judging by everyone else’s plate, the sky’s the limit! Order one of their towering biscuit sandwiches and you’ll find it near impossible to pick up with your hands. If you’re fortunate enough to grab one of the few spots to sit, take your time slathering your biscuit with any one of their sweet or savory jams. Few things on this earth feel as rich. It’s the butter. 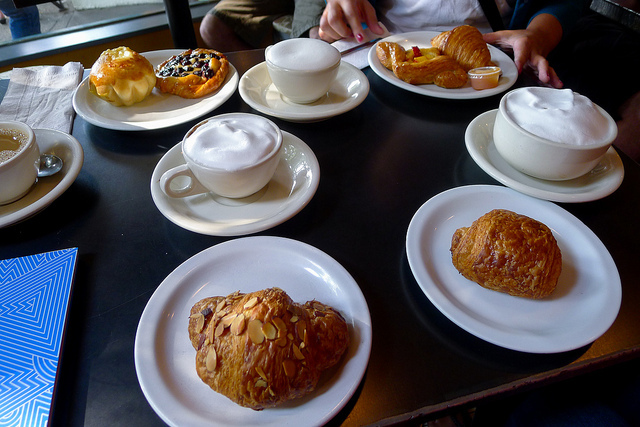 Honoré’s closest competition, Café Besalu is a worthy opponent and just a mile away, which means that in theory, you could hit two of the city’s best pâtisseries in a morning – a noble goal if you are the kind of person who jumps out of bed at seven a.m. Otherwise, wake up as early as you can muster, and prepare to stand on line. You may not beat the crowds, but you will walk away very, very satisfied. My advice is to go with a group (even though the line looks imposing, I’ve had great chance finding a table at just the right moment), and buy as many pastries as you can hold. This way, you’ll get to try everything that you wanted to order, and you won’t be forty dollars poorer for it! For those with the restraint to only order one or two, I’d suggest Besalu’s classic croissant and almond schnecken. For a serious Sunday morning stroll, do check out the Ballard Avenue Farmers’ Market between Vernon Place NW and 22nd Avenue NW. Tucked between stands overflowing with local fruits and veggies is the real sustenance that your body needs: mini donuts! 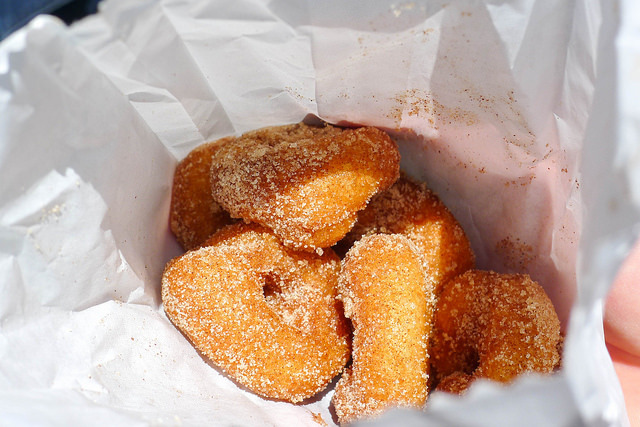 Located conveniently at the entrance of the market on 22nd, these little beauties barely have time to skip through piping hot oil, into a paper bag, coated with cinnamon and sugar, before being shoved into your grasping hands for immediate consumption. I would hardly call myself a donut fan, but these may be the ones to convert me; incredibly soft, chewy and warm, between Phillip and I, a dozen doesn’t last more than a couple of minutes. The trouble with moving away is that when you return, it’s never quite as you left it. Perhaps there’s a new bakery that’s just popped up, or a tried-and-true classic that I never stumbled upon? Now is the time to share that information (in the comments), and quick! I think I may need to go splurge at the closest patisserie after reading this post. 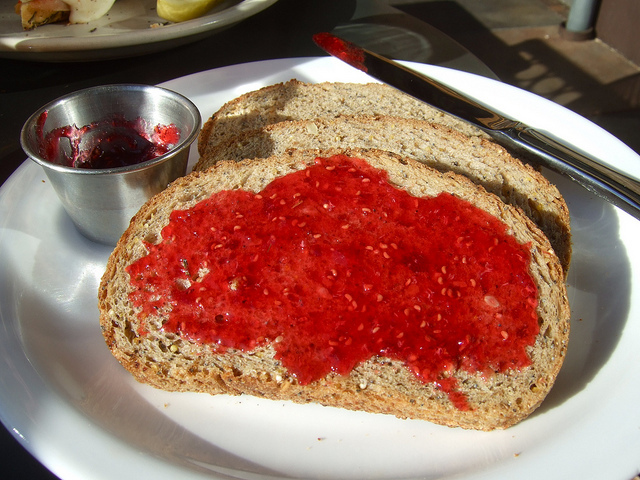 I’ve been asking everyone about freezer jam… Californians generally don’t seem to know. It’s a shame because I really want some! Glad that it has been a recurring toast accompaniment in your life for so long! Don’t worry, I scarfed down an “oranais” (a.k.a. croissant aux abricots) today. I hope you get your hands on some freezer jam soon! If push comes to shove you can always get a crap tone of berries and make some! Tis the season, after all. Ooh! In that case, I’d better get on with sharing more things from the neighborhood, French or otherwise!